Boil 1 liter of spring or distilled water. After boiling water, pour a shallow tea spoon (~3.5 grams) into the boiling water and let it boil on a very low heat for 5 to 10 minutes. Pour everything into a thermos, put a lid on (tide it) and leave it overnight. In the morning strain /Drain it and drink the complete liter dividing it in 3 or 4 different dosages during the day, between meals (on an empty stomach). Common Names: Kutu Kutu, raqui raqui, daradilla. Properties: Wild. It is used against diabetes. It has been used as an anti-diabetic. It said to regulate blood sugar level, and t helps to restore insuline secretion. 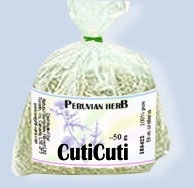 It plays an important part in treatment of pancreas. Taken in two weeks intervals with Pasuchaca can elevate significantly the symptoms of diabetes. Highly priced in Europe. 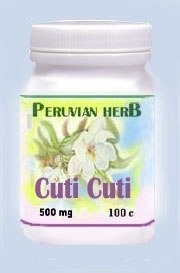 Incan word "cuti" is defined as "to overturn".